Following up his successful Beat Konducta vinyl-only releases, Madlib rounds out his first CD collection of hip hop instrumentals with Beat Konducta Vol 1-2: Movie Scenes. When a rapper decides to inject an additional moniker or “a.k.a.”, it’s usually to add personality. In the case of Madlib, it's more like method acting. Whether it be the fun loving Quasimoto, or the band leader of Yesterday's New Quintet, he has more aliases than the Wu-Tang Clan combined. 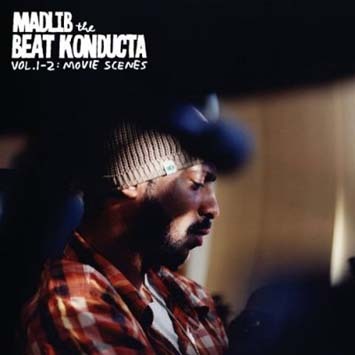 This time around, Madlib invokes his producer persona on Beat Konducta Vol.1-2: Movie Scenes (Stones Throw). Gagging Lord Quas on this effort, it is an instrumental album chock full of his signature So-Cal soul inspired beats-eccentricities and experimentation included. These new, original tracks have been culled from the now-legendary beat CDs which provided the basis for Madlib's 2004-2005 productions from Madvillain, Quasimoto and Jaylib. Movie Scenes presents a vivid hip hop soundtrack for each mood in the model of vintage "library records" made for TV and film background music in the funky 1960s & 70s. Each of the 35 tracks has a title as well as a parenthetical mood or theme to correspond with what's unfolding on the screen. The film is for you to imagine, the score courtesy of Madlib the Beat Konducta. heu ... ?b "the score courtesy of madlib the beat konducta"